Zion is one of the oldest Lutheran congregations in Connecticut. It was organized in the 1870s by early Swedish immigrants who settled in Portland. Many of these immigrants worked as stonecutters in the Portland brownstone quarries. These faithful Swedes were church-minded and missed the organized spiritual life of their homeland. They soon made a request for an Augustana Lutheran pastor to assist in the organization of a church. With the help of Pastor J. G. Princell of New York City, they formed, on August 8, 1873, the Swedish Evangelical Lutheran Missionary Society of Portland. They started with 14 members and met each Sunday in the Sunday School room of the Portland Methodist Church. At a special meeting on June 5, 1874, the small missionary society decided to become a true church, and the next day, by vote of the membership, “The Swedish Lutheran Zion Church of Portland, Connecticut” – later changed to Zion Lutheran Church – came into existence. It was a small congregation, consisting of 67 communicants. On March 21, 1875, the congregation petitioned for membership in the Augustana Lutheran Synod and was accepted. In 1879, the members decided to erect a church of its own on Waverly Avenue. They built the original church with their own hands. 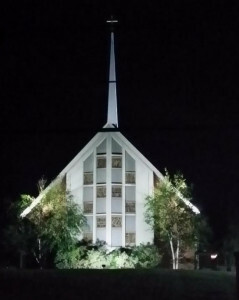 When the church building was destroyed by fire as it reached completion, they did not give up but faithfully rebuilt it, taking turns to stand guard every night at the site to prevent any possible arson attempt. 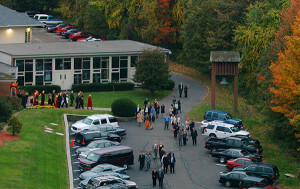 Today, the members of Zion worship in a modern building constructed in the 1960s. The first service was held in the Fellowship Hall at the new site on William Street on April 14, 1963. Five years later, on May 10, 1968, the members of Zion worshipped for the first time in the sanctuary of their beautiful new church. In 2004, the congregation of Zion Lutheran Church undertook its final step in completing the building complex. A Sunday School wing was that includes classrooms, a meeting area, restrooms and an office, replacing a worn out “temporary” Sunday School building that was built back in the 1960s along with the original structure. Called “The Promised Land”, this educational wing also houses the Sunny Hill Pre-school and due to the fact that it is air-conditioned, serves as the place for worship during hot summer months. The story of Zion is not limited to its buildings, however. It is the story of dedicated people, pastors and laymen alike. Among the early pastors was T. O. Lindell, who traveled from Pontiac, Rhode Island to conduct services in Portland. Resident pastors included Pastor J. Mellander, 1879-1883; Pastor Lars P. Ahlquist, 1883-1902; Pastor Ludvig Holmes, 1903-1908; Pastor Ernest C. Bloomquist, 1908-1913; Pastor Carl G. Erickson, 1914-1920; Pastor Efraim Cedar, 1920-1929; Pastor Frank A. Anderson, 1930-1943; Pastor Harry A. Peterson, 1943-1959; Pastor Robert C. Linke, 1959-1975; Pastor David R. Cote, 1975-1990; Pastor Joseph Bourret, 1991-1993, Pastor Maryellen Muller, 1993-1999; and Pastor James Reemts, 2000-2015. Pastor Kari Rinas is our current pastor. And where Zion was first established by Swedish immigrants, the congregation now has members from many different ethnic backgrounds. All are welcome. If you are interested in learning more about Zion Evangelical Lutheran Church, give us a call. We’ll be happy to answer your questions. Contact us at zion.lutheran@snet.net or 860-342-2860 .